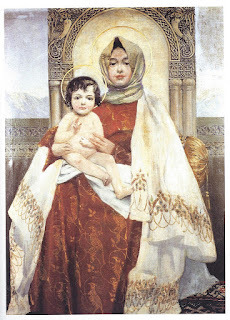 A multifaceted artist and intellectual, Vardges Sureniants is considered the founder of Armenian historical painting. He was born in Akhaltskha (Akhaltsikhe), in modern-day Georgia, on February 27, 1860. His father Hakop was a priest who taught religious history. After their family moved to Simferopol, in Crimea, in 1868, his father was appointed to the Armenian diocese in Moscow. This gave young Sureniants an opportunity to study at the prestigious Lazarian School from 1870-1875. From early on, the future artist showed his interest and aptitude for the arts. He furthered his education at the department of Architecture of the Moscow Art School (1875-1878). He went to Munich (Germany), and after a year at the department of Architecture of the Academy of Fine Arts (1879), he made a crucial shift and studied at the department of Painting for the next five years until 1885. Sureniants became interested in caricatures and sketches during his years at the Lazarian School. In Munich, some of his caricatures were published in the Fliegende Blätter magazine. The painter traveled to Italy in 1881 and visited Venice, including the island of San Lazzaro. In the library of the Mekhitarist Congregation he studied Armenian fine arts and manuscripts. In 1883 he published his first article, about Armenian architecture, in the daily Meghu Hayastani of Tiflis. After his return to Russia, in 1885–87 he traveled to Persia as a member of the scientific expedition led by Valentin Zhukovski, a professor of Oriental Studies at the University of Saint Petersburg. They visited the cities of Tabriz, Tehran, and Shiraz, and Sureniants spent several months in Ispahan. Afterwards, he translated William Shakespeare’s play Richard III and sent it to the celebrated Shakespearean actor Bedros Atamian (1849-1891), in Constantinople, to have it produced there. He would later translate Midsummer’s Night Dream and some of Shakespeare’s sonnets. He taught painting and general art history at the Gevorgian Seminary of Holy Echmiadzin in 1890-1891. After 1892 Sureniants participated actively in the artistic, theatrical, and social life of Moscow, Saint-Petersburg, Tiflis, and Baku. He visited Ani and Lake Sevan, and became familiar with historical monuments and everyday customs of Armenian rural life. He also studied the Armenian illustrated manuscripts in the repository of the monastery of Holy Echmiadzin. He traveled to France and Spain in 1897-1898. He has been categorized as a realist painter in his representations of landscapes and historical events, and played an important role in the revival of the Armenian past through art. His paintings would reflect the aesthetic knowledge acquired during his studies and his travels. In 1901 he held a solo exhibition of his works in Baku, which would be his only exhibition in his lifetime. Afterwards, he moved to St. Petersburg, where he worked as a stage decorator until 1915. Sureniants was also known for his illustrations of famous literary works, such as Ferdowsi’s Shahname, Alexander Pushkin’s The Fountain of Bakhchisaray, Oscar Wilde’s fairy tales, and works by Belgian poet Georges Rodenbach and Armenian poets Smbat Shahaziz and Alexander Tzaturian. 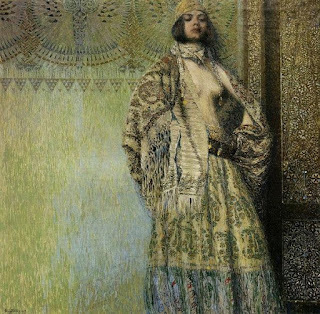 His famous painting “Salome”(above, left) was included in the exhibition dedicated to the 100 th anniversary of the Academy of Fine Arts of Munich (1912). 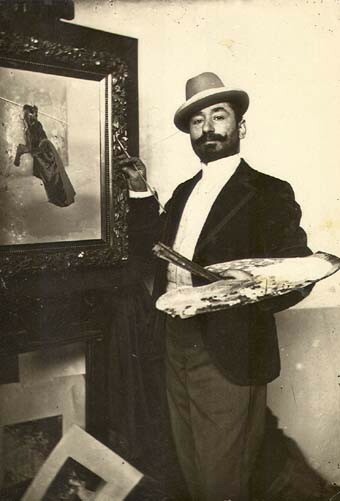 In 1915 he returned to the Caucasus, and in 1916 he founded the Armenian Artists’ Society, together with Yeghishe Tateosian, Martiros Sarian, and Panos Terlemezian. He also made many paintings of survivors of the Armenian Genocide. 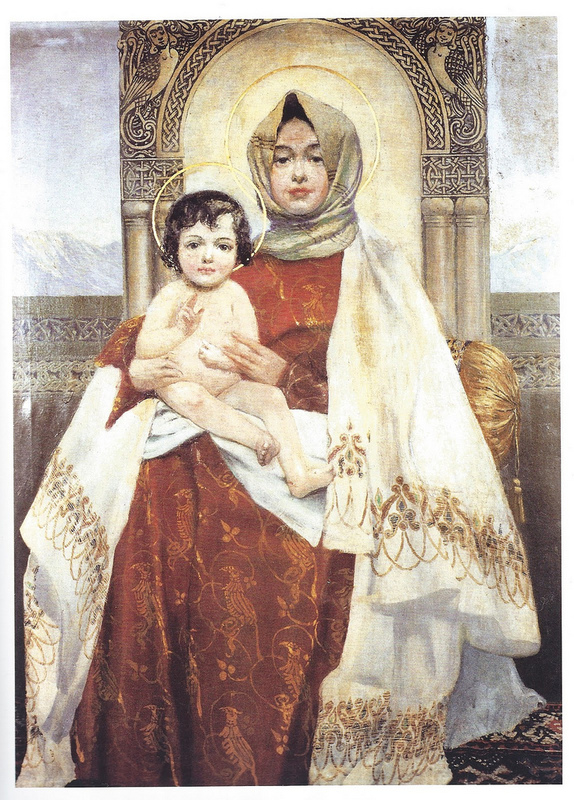 In 1917 Sureniants moved to Yalta, in Crimea, where he was commissioned to draw the decorations for the newly built Armenian cathedral. He decorated the altar (above, right), walls, and dome of the church. However, he suffered a grave illness during his task. He passed away on April 6, 1921, and was buried in the courtyard of the cathedral he had contributed to decorate.